I have been using General Finishes Arm-R-Seal semi-gloss Oil&Urethane wiping varnish on an oily wood table top and wonder if anybody else has tried this finish lately? I sanded the wood to 400 grit and 4/0 steel wool. Wiped on three 0.5# cut of super blonde shellac (dissolved from flakes) and let it cure for two days. Applying this wiping varnish to get a thin smooth coating seems to be problematic or just plain difficult. I'm looking for a super smooth finish without any swirl marks being seen at low angles. Anybody have experience with this product? Your photos don't make the swirls visible. Varnish of any kind is going to be affected by the temp, humidity, debris in the air while it cures, etc. I've used that product a little, and (good news?) it's easier to work with than a lot of varnishes. That said, most varnishes are just plain problematic to get laid out perfect. The cure is rubbing them out, which isn't so easy on a wiping version. I hate to say experiment on a piece you're working on, because the film thickness is going to be thin, but you might try just a small wad of cotton in a corner with a little bit of fine cut polish and see what it does for you. In the past, I have experienced identical frustrations. What has worked for me is the above - knocking any nits off, cooling the temp down, controlling the application, making sure it's dust free. Wiping such a large area (table top) with varnish can be a bit of a nightmare, and I try to avoid it at all costs. It's incredibly difficult to get a completely flat finish without some kind of rubbing out, as Randy mentioned. If I want that oil/varnish look, I now use Liberon Finishing Oil. It's good stuff and easier to use. You can give it a very light rub between coats with an abralon pad or something similar. I put the stuff in a squeezy bottle and squirt it on the surface and rub. It dries quickly. I should mention that the photos were after I re-finished this top 3 times going back to bare wood in complete frustration with the swirls. This last time, after applying the shellac and rubbing that with 4/0 steel wool I thinned the varnish 25% for the first coat and second coats and then after a three day cure applied the final coat full strength. In all my practicing took two months and two quarts of Arm-R-Seal. I was pretty stubborn because I wanted to highlight the wood without darkening the color and also wanted that protective varnish coating. I'm finally finished with that top but, I'm still trying to gain knowledge on that and other non-spray varnishes for future projects. What kind of surface protection do you get with the Liberon Finishing Oil? 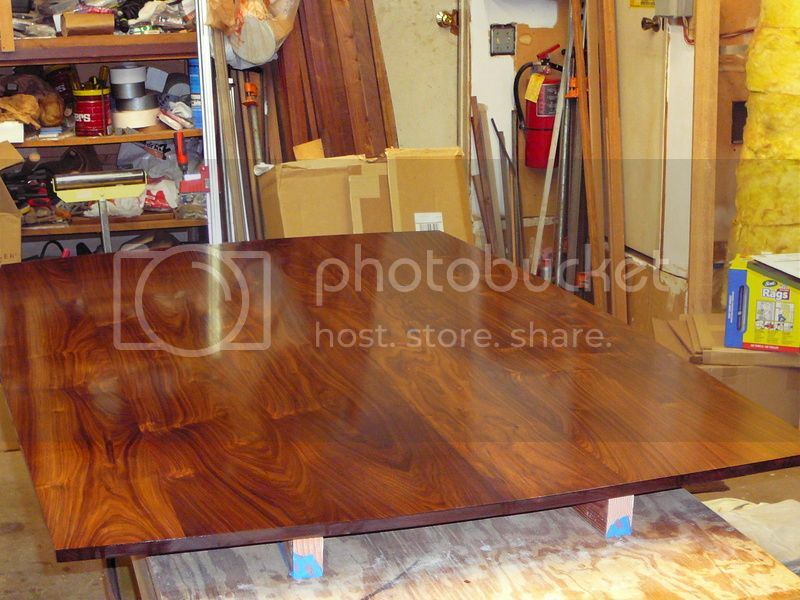 I have a black walnut table that I've tried to finish with a homemade BLO, Tung Oil, and Varnish (a Sam Maloof type mixture). It gave the top a great look but daily use was tough on the finish. I've tried Minwax Wipe-On Poly with the same result (getting beat up with daily use). I'm curious about the protective qualities of Liberon, is it a hard finish? I usually rub on 6 or more coats for a lovely sheen look. After three coats it's important (in my opinion) to give it a light rub with a pad between coats, it really helps the next coat on. With 6 coats or more, I've found Liberon finishing oil to hold up very well, better than the maloof type mixes that I've also used. Liberon dries quicker and is easier to use, plus stronger. It's the most consistant oil type finish I've used, a very good all rounder and it pretty much guarantees a good result. If you get the application and timing right, there's almost nothing to wipe off. I've used the Rockler Maloof finish quite a bit, and love it for most things. But for a table top I'd want something more durable. So, as a test, I made a piece I call my "table lingerie" (because it's beautiful and it's always underneath something). I used the Minwax Wipe-On Poly. I abuse it with hot/cold/wet/scratchy ceramic things. It looks exactly the way it did when I made it several years ago. I'm really impressed with that finish, and intend to use it on any pieces that will be getting that kind of use/abuse. Beds and coffee tables will still get the Maloof finish. But benches, tables, etc., will get the Minwax, I think. At Okami's suggestion, I have used Liberon finishing oil on walnut with great success. On other, more pedestrial projects, I have had good success with Minwax wipe on poly, although it takes many coats to build up a good finish, but goes on smoothly for me. I have used Arm-R Seal, worked well, but hard to get a smooth finish for me. Has anyone tried the method for poly discussed in FW this month? Sounds like an interesting way to quickly build up a smooth finish, without spraying and without sanding out way too many coats of wipe-on poly. I was wondering if anyone has tried this with success. I have used the Minwax Wipe-On Poly on some mahogany cabinets and after several layers on the cabinet tops, I sanded with 400 grit Garnat and then went through the grits with Platen 2 up to 4000 grit and the top looks silky smooth. I just didn't see a need to brush on the poly since I could recoat every few hours to get a nice build. I just did a simple project that I used Odie's Oxy Oil on. It was very easy to use and left a silky smooth surface. The client was very happy!